a half-forgotten fault, love turns to hate. a fever breaks, an epidemic's done. and trembles just a bit--a sigh? What now? Hinged wings were never meant to fly. that women said would almost wear you down. its ranting at the windows and the doors. the wind was with you endless as your chores. Best keep oneself inside, they all agreed. standing on a porch, holding up the roof. Doris Watts lives in Temecula, California. Her poems have appeared in Mezzo Cammin, The Formalist (she was twice a finalist in the Howard Nemerov Sonnet Competition), Blue Unicorn, The Lyric, and The Mid-American Poetry Review. She has work forthcoming in 14 by 14. She graduated from the University of Redlands and completed a Special Major Master's Degree in Technical Communication at San Diego State University. She has worked as a usability specialist, examining the human interface with hardware and software documentation, and as a technical writer. Earlier work in Mezzo Cammin: 2009.2 & 2009.1. Alice Mizrachi: Growing up in New York, I have been immersed in a culture that is constantly growing. Throughout my work you can feel the influence the city has had on me, the never-ending desire to grow and flow. One common thread in my work is the texture--rhythm and layers. I love to incorporate tactile surfaces that compel the audience to approach and feel it. Timeless and universal, my images evoke a raw feminine energy that leaves you feeling nurtured. 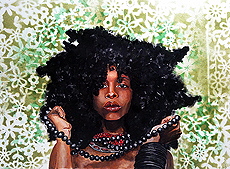 My art is a vehicle to express to the world my journey as a NYC female artist in the past, present and future. I am logging my time here. After completing a residency in Paris during 2010, I am focusing on residencies in other cities with the intention of spreading my art globally.